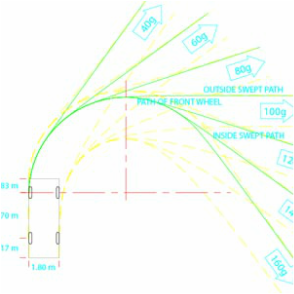 Swept Path is a term that is frequently used in combination with vehicles calculating the swept path of a specific vehicle. It is also a known nautical term to indicate the width of a minesweepers lane. This website focuses on the swept paths of vehicles, mainly used by transportation professionals. When speaking about Swept Path in transportation one usually refers to Swept Path Analysis. Here the movements of different parts of a vehicle (for example each separate wheel) are analyzed. ​Swept Path Definition: The envelope swept out by the sides of the vehicle body, or any other part of the structure of the vehicle. Every vehicle type has it's own swept path. This animation shows a Swept Path calculation where a truck drives through a gate, followed by a reverse docking maneuver. When you look at the design you can see that there should be no conflicts when doing so. This shows the same situation as the animation on the left but this time you can see the truck in 3D. In 2D we could conclude there would be no conflict, the 3D brings this to life.